In our experience one of the most challenging aspects in ECM projects involves moving content from one or more existing application systems and/or network file-shares into the chosen repository. SynApps Solutions has extensive experience in migrating content and associated meta data from legacy external sources (file systems, databases, Content and Document Management Systems, etc.) into a variety of ECM repositories. In response to these ECM project challenges we have developed a powerful and comprehensive content migration product that has been used to transfer content and metadata from a wide range of custom, in-house and proprietary applications. 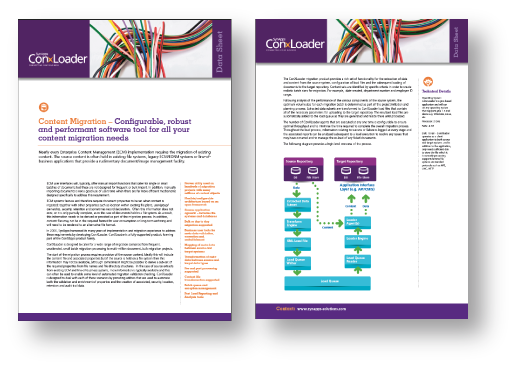 ConXLoader is XML-based and incorporates full audit trail reporting to ensure that no content or data is “lost” in migration and that any anomalies are identified and reported on for remedial action.